Visiting Australia for seminary holidays is Cameroon Marist, Christian Abongbung SM. A student at Pacific Regional Seminary, Suva, Fiji, Christian first met the Marist Fathers in 1997 through their African mission where Fr Bob Barber SM was pastor of Bambili parish, Cameroon. Fr Bob is host for Christian’s vacation at Villa Maria, Hunters Hill. Joining the Marists in 2002, Christian has spent his formation years with Marist students in the Pacific and hopes for perpetual profession and diaconate within the next few months. He will then complete his final year of studies at Suva before priestly ordination in early 2011. The stretched resources of the government medical system place Davao’s mental hospital ‘right at the bottom’, says Fr Gavin. Also on the wish-list are uniforms for their patients to replace the drab, institutionalised smocks, the same for women and men. Fr Gavin is developing a mid-week ministry of visitation and ‘human contact’ for patients to complement the weekend activities of the 'Samahang Marista’ (Marist lay group) which accompanies him for Sunday Mass. Others bake and deliver bread to supplement to hospital’s food stock which often run out by the weekend. On his return to Davao Fr Gavin will take up a training role in the Clinical Pastoral Experience (CPE) program of the government medical centre. He plans to involve his students with practical experience at the mental hospital. Australian residents wishing to assist with suitable books or donations for mailing costs, contact ‘webmaster’ for details. Six members of the Sydney-based Catholic Asian Students' Society (CASS) have returned from their Summer journey to Thailand and Cambodia to experience 'The Other Half'' (TOH). Their first call was the Marist Mission at Ranong, Southern Thailand, spending time with the team ministering to Burmese migrant workers. The young Australians then journeyed to Phnom Penh in neighbouring Cambodia to visit Youth with Disabilities Foundation for Education and Employment (YODIFEE), established some years ago through Australian Marist Mission Centre funding. 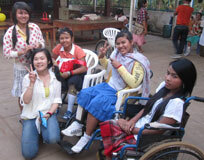 MMC continues its support for disabled Khmer youth through YODIFEE. 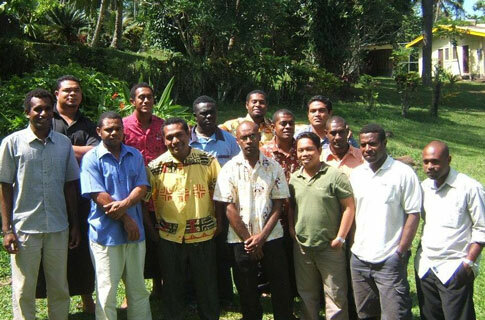 Fourteen young men from the Pacific and the Philippines make up the 2010 intake for the Marist novitiate, Tutu, on the island of Taveuni, Fiji. One of them, Dindo Calvo, is the fourth Filipino novice to come to Tutu, the first being Fr Larry Sabud SM, now District Superior of the Philippines. The thirteen Oceanians have already commenced their Marist formation in the two seminaries of the province: Marist College Bomana (PNG) and Marist College Suva (Fiji). 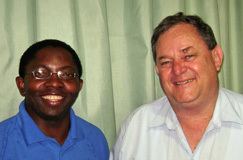 Australian, Fr Ben McKenna SM, will be their novice master assisted by Fr Boniface Kevon SM and Br Iosefo Cakaunivalu SM. Back row from left: Pierre (Tonga), Mika (Fiji), Adrian (Bougainville), Thomas (PNG), Paulo (Fiji), Lutoviko (Tonga) and Peter (Solomon Islands). Front: Paul (Fiji), Xavier and Joseph (PNG), Aubin (Solomon Islands), Dindo (Philippines), Louis (Vanuatu) and Alick (Solomon Islands). It is two years since Kiwi Marist seminarian, Jeremy Gray SM, drowned tragically on Jan 02, 2008, after saving the life a young boy on a parish picnic in New Caledonia. Jeremy was well known to Australian Marists through his novitiate training in Sydney in 2004 and participation in Marist Mission Centre-sponsored 'The Other Half' experience, 2005-06. 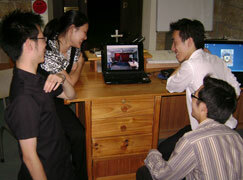 2004, Jeremy's novitiate year in Sydney. Left: with fellow novices, Matthew Crawford and Christoph Kochmann. In the summer of 2005-06 Jeremy was part of 'The Other Half' journey to Thailand and Cambodia. Left: medal-winning achievement at Maesot / with Fr Mike Shea CSsR, Don Vai, Thailand. Centre: with AIDS-afflicted and orphaned children, Nongkhai, Thailand. Right: music for a TOH Mass / exchanging addresses at Mae La refugee camp, Thai-Burma border. Left: Jeremy's gift of his bible to a newly-baptised Cambodian lad, Jan 2006. 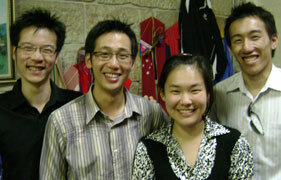 Centre: With fellow Marists on TOH 2005-06. 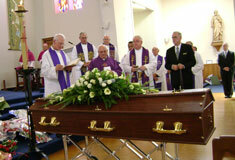 Right: Jeremy's funeral Mass, St Mary's, Christchurch, NZ, Jan 2008.